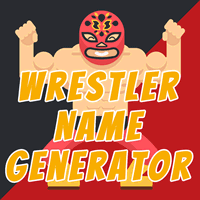 Pirate Name Generator for Salty Sea Dogs! 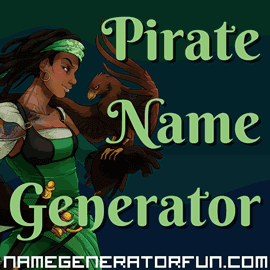 Hoist the Jolly Roger, sharpen your cutlass, and splice the mainbrace – it's time for you to embrace your inner piratical nature with our pirate name generator! This generator was put together in 2013, and was created with International Talk Like A Pirate Day (September 19th) in mind. So – if you're ever in need of a pseudonym to hide your dastardly deeds, then you've come to the right place, for we've got pirate treasures aplenty (along with a frankly ludicrous amount of rum). Piracy has a long and violent history that dates back thousands of years. The act of using a ship to commit violence against another ship or a coastal settlement has been happening since at least 1400 BC, when ships in the Mediterranean and Aegean seas came under attack from groups of raiders. Since then, it hasn't taken much to push certain sailors into becoming privateers, utilising narrow stretches of water and predictable shipping routes to prey upon the less well-defended and claim a profitable bounty, often leaving violence and bloodshed in their wake. Piracy is still a problem today, and travelling areas like the Somali coast, the Strait of Malacca and the waters between the Red Sea and the Indian Ocean means taking the extreme risk of running afoul of armed and well-resourced pirates whose activities can cause damage and losses running into billions of dollars. However, when people think 'pirate', they're generally thinking of one particular kind of pirate – the renegade sailors that hail from the so-called 'classic era of Piracy' in from 1650 through to around 1720. At a time when England, France and the Dutch Republic were consolidating their empires and stretching the hand of colonialism across the world, there was a massive increase in trade, with the result that suddenly there were lots of wealthy, relatively unprotected ships to be found, and serious money to be made. This was heightened by the presence of French 'buccaneers' – privateers and free sailors who spent the early 1600s living off the land on the Caribbean islands of Hispaniola and Tortuga. Plagued by the Spanish who at that time had the balance of power in the Caribbean, the buccaneers targeted Spanish shipping, and when the English Navy captured Jamaica from the Spanish in 1655, the English gave the French buccaneers official permission to continue with their seabound attacks on the Spanish trade ships. As far as the English government was concerned, piracy was an easy and cost-free way of causing havoc for their Spanish rivals. (This was not an unusual occurrence, either – in the previous century, sailors as famous as Sir Francis Drake had often carried out pirate attacks on Spanish shipping with the full backing of Queen Elizabeth I). When the French government had the same idea, and offered their own colonists and the free privateers the chance to go freebooting with legal backing, the result was an explosion in piracy the likes of which had never been seen before. 'Buccaneers' was soon universally adopted as a name for pirates in the 1680s, and the Jamaican governor's acceptance of piracy (and his decision to allow pirates to base themselves at Port Royal) made the island massively prosperous. There were even times when privateers and buccaneers were led by Royal Navy officers on specific missions against the Spanish, and the English government were happy to see the activities continue whether they were still at war with Spain or not. This soon spread far beyond the Caribbean, with piracy a common occurrence in the Indian Ocean and off the East Coast of America, and the explosion carried on until the 1690s, when the governments of both England and France began to back off from officially sanctioning piracy. Naturally, this didn't end piracy, and the activity in the Caribbean continued for many years, until basically dying off in the early 1720s, as pirate crews sought more profitable targets elsewhere. Names were vital for pirates. Having the right nickname to strike fear into your enemies was always a useful advantage, but while not every pirate used an attention-grabbing nickname, many would still utilise a fictional name when carving out a career as a privateer. This was largely done in order to preserve their family name and prevent any scandal from their deeds being known, especially during the period where piracy was lucrative, technically legal and backed by multiple governments. Pseudonyms were also a useful way of protecting reputations when sailors made the shift from honest men to criminals, and enabled many respectable characters to stray into piracy while still maintaining an air of law-abiding justice. Edward Teach is possibly the most notorious of all historical pirates, and the one whose reputation contributed to the romanticised idea of what a pirate is. An enigma until relatively late into his life, he's reckoned to have been a sailor and privateer for most of the 'classic era' of piracy, but Teach truly forged his reputation when he joined the crew of pirate captain Benjamin Hornigold, and later captured a French merchant vessel, transforming her into the Queen Anne's Revenge, a heavily armed ship primed for pillaging. Known as Blackbeard for his flamboyant, bearded appearance, he soon embarked on a reign of terror across the Caribbean in the mid-to-late 1710s and built up an alliance of fellow pirates with a flotilla of ships, regularly attacking French merchant shipping and even going so far as to blockade the US port of Charlestown in South Carolina. Teach was even later granted a royal pardon for his activities, but couldn't resist the lure of piracy and returned to his old ways, ultimately dying in a confrontation with soldiers on the 22nd of November 1718. He might have only been a pirate for two years, but Henry Avery (who was also sometimes known by the name Every or Evory) became known as the 'King of Pirates' thanks to pulling off one of the biggest and most profitable heists in history, and especially due to him successfully retiring without being caught or killed (a rarity when it comes to pirates). A navy man turned independent sailor, Avery was serving on board the ship Charles II in 1693 when the crew mutinied and elected him captain. His biggest pirate pay-day arrived when he and his crew mounted an attack on a 25-ship fleet of vessels commanded by the Grand Mughals, on their annual pilgrimage to Mecca. Avery came away with £600,000 in loot – the equivalent of over half a billion pounds in modern currency – and successfully evaded a £1000 bounty set on his capture by England's Privy Council and the East India Company. He vanished from all historical records in 1696, and unconfirmed reports suggest he may have retired to a tropical island, while no trace of the treasure he stole was ever found. A Scottish sailor who settled in New York during the 1680s, Captain William Kidd gave all indications of being a respectable privateer despite originally becoming captain thanks to a mutiny. Placed in command of the ship Adventure Galley, Kidd was ordered by the governor of New York, Massachusetts and New Hampshire to embark on a mission to hunt down dangerous pirates like Thomas Tew and Thomas Wake, but Kidd took to the job with far too much enthusiasm. When an outbreak of cholera and other onboard disasters brought the mission to the brink of failure, Kidd responded by raiding any ships he could get his hands on, while Kidd also earned a fearsome reputation for mistreating his crew. His decision to raid the Indian trade ship Quedagh Merchant backfired spectacularly, earning him the official reputation of a pirate, and soon after that his first proper encounter with a rival pirate resulted in most of Kidd's crew abandoning him. Despite trying to evade capture by authorities, Kidd was eventually imprisoned, tried for piracy, and was hanged on the 23rd of May 1701. One of the few female pirates to successfully carve out a reputation for themselves in the Caribbean, Anne Bonny was an Irish sailor who was allegedly disowned by her father for marrying against his will. Soon afterwards, sometime in the late 1710s, Bonny and her husband moved to the Bahamas and their contacts in the world of piracy soon resulted in her becoming the lover of infamous pirate John "Calico Jack" Rackham. Bonny served as a member of Rackham's crew by disguising herself as a man, and while she briefly departed the ship when she became pregnant, she soon returned to a life at sea, abandoning her child along with her husband. Bonny went on to help Rackham and fellow female pirate Mary Read in numerous pirate raids, until in October 1720 they were all captured by the Royal Navy. Bonny and Read became the only women ever convicted of privacy, although they were spared due to being pregnant, and Bonny was later released from prison and disappeared from the historical record. A privateer who showcased a remarkable amount of luck, Henry Morgan was a welsh sailor in the West Indies who rose to prominence when he was given a 'letter of marque' in 1667 – a legal licence to raid Spanish vessels. Morgan went on to carry out a massive series of daring raids on Spanish colonies along the coast of South America, attacking Cuba and Panama and even managing to destroy and entire squadron of Spanish naval vessels. He went on to attack Panama City in 1671 – but then, thanks to a peace treaty signed with Spain, Morgan found himself under arrest. However, despite being summoned to London in 1672 to answer for his crimes, Morgan's reputation as a heroic fighter against the Spanish saw him embraced as a hero, and two years later he was instead appointed a Knight Bachelor. After this, he returned to the West Indies and served as Lieutenant Governor of Jamaica for many years, although rumours from fellow crewmates of atrocities committed by him during his career as a privateer dogged Morgan until his death in 1688. Image Credit: Pirate by Jamie Carr.